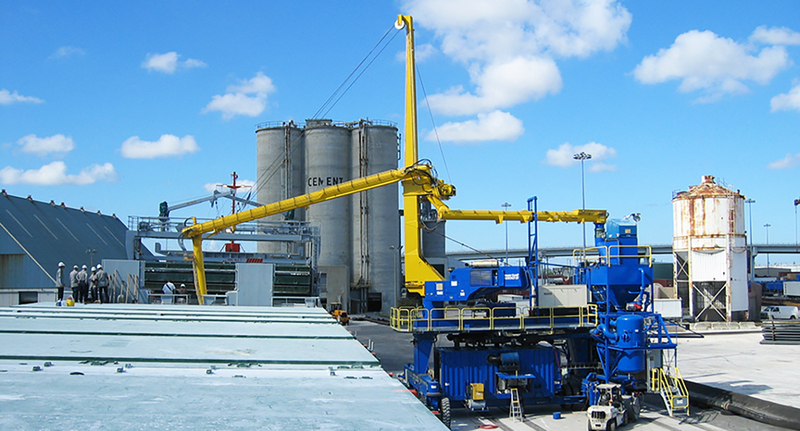 Siwertell was awarded this contract by Cemex Inc, USA, for two gantry-mounted mechanical Siwertell 10 000 S ship unloaders, each fitted with a pneumatic blow pump system for cement. One unit was installed in West Palm Beach and the other in Wilmington. The customer’s needs were that the units should be hard-wearing, capable of high capacities, provide environment-friendly operation, include pneumatic conveying directly into cement silos, be of low weight and have a low energy consumption. 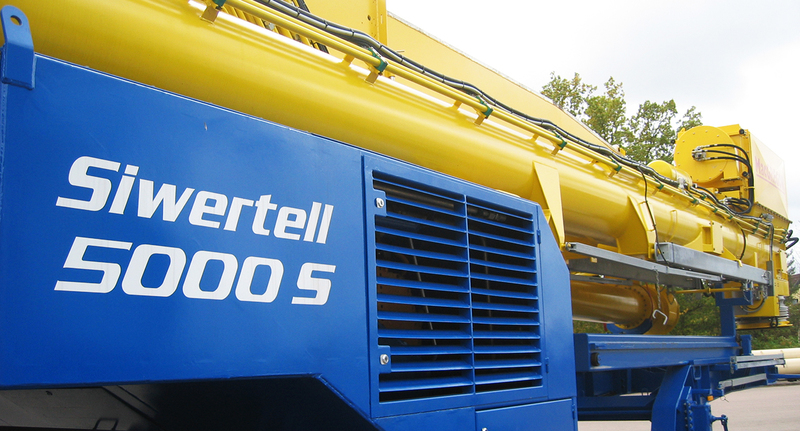 The Siwertell 10 000 S, with an integrated blow pump system, met all these requirements. Siwertell has developed an integrated mechanical/pneumatic unloading system that blows the cement directly into storage. The main components of the pneumatic pump is a diesel-driven compressor placed under the gantry, a hopper for receiving cement from the Siwertell unit and two pressure vessels for pressurising the cement for efficient conveying. The discharge rates are 300t/h for distances up to about 400m. 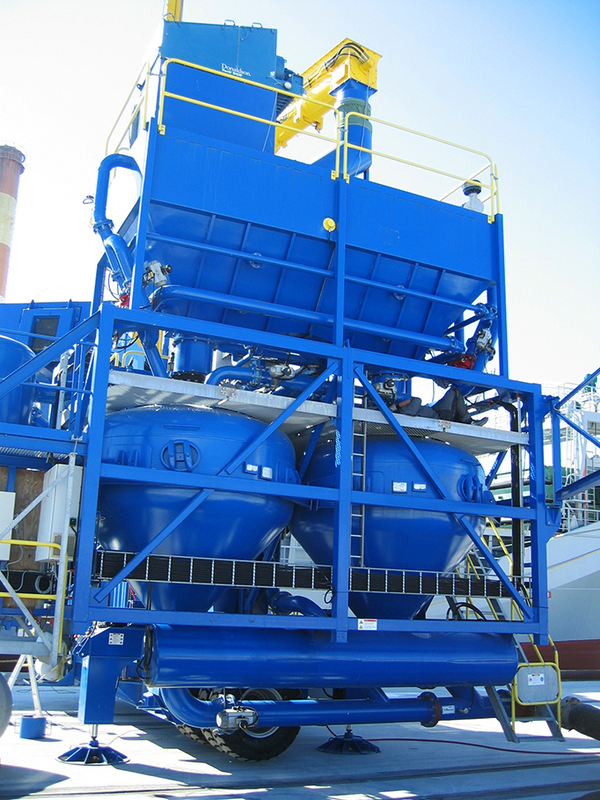 The Siwertell unloader is one of the most environmentally-friendly shore-based ship unloading systems and can therefore be used in pollution-sensitive sites or those close to populated areas. Its conveying line is based on totally-enclosed screw conveyors configured in such a way as to create an under pressure in the system that eliminates dust leakage at connections between the different conveyors, as well as at the transfer point between the unloader and blow pump system. Cargo pick-up is carried out below the cargo surface in the ship’s holds. The Siwertell unit is designed for a layer-by-layer unloading method, which considerably minimises dust creation inside the hold from cargo avalanches. Also, the unloader and blow pump system are normally equipped with diesel engines, which are continually upgraded to comply with the latest exhaust and noise emission regulations. All equipment is installed on a gantry with rubber wheels. Due to its low weight and a diagonal steering arm system, the unloader is highly manoeuvrable in spite of its size and a front-end loader can be used to tow the unit along the jetty for access to each of the ship’s holds. If the customer prefers a more sophisticated unit, it can be equipped with self-propelled rubber wheels that are operated from a remote-control box.